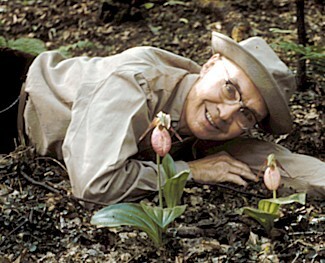 and served as a resource of knowledge on the flowers of Pennsylvania. Our early affiliation with the Carnegie Museum of Natural History, especially the Section of Botany — which has served as a repository for many of our collections and slides of the wildflowers of Pennsylvania — is ongoing. Members are called upon to teach classes in Botany, and to give public presentations to garden clubs and other plant societies and organizations. BSWP is closely allied with the Presque Isle Audubon Society, with whom it co-owns and protects Titus Bog in NW PA, and with the Wissahickon Nature Club of Pittsburgh, as well as with other organizations in the region. Top right: The northeasternmost native range of Blue-eyed Mary (Collinsia verna) is in southwestern Pennsylvania, and so it is a favorite of BSWP members. Large photo: Members at Glade Bog, Westmoreland County, October 1, 1955. Left photo: Member Max Henrici and pink ladyslippers, in the late 1950s. 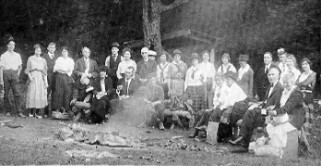 Above: A BSWP outing in the early 20th century. Blue-eyed Mary photo courtesy of Gail Eichelberger, www.clayandlimestone.com.